Sacramento is home to some unique neighborhoods, each with distinct architectural styles. We live in one of the Mid-Century Modern clusters in South Land Park. What is interesting about our home is that it is an Eichler and that it has a second story addition. Once my child found those stairs leading up to the second story, it became imperative that we put up a gate at the top and bottom of the stairs. As a Mid-Century home owner, we were determined to have a gate that was both functional and complimented the era of our home. 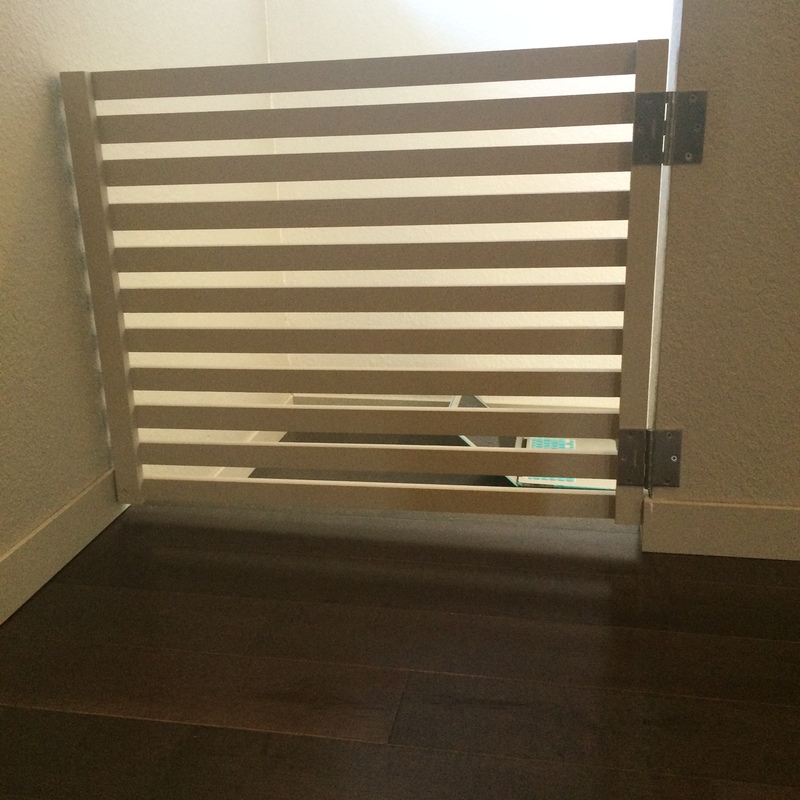 We searched for a modern, but simple baby gate online and couldn’t find one that fit our needs. Most gates are in a doorway, which is easier for installation because you can fasten your latch on the other side. 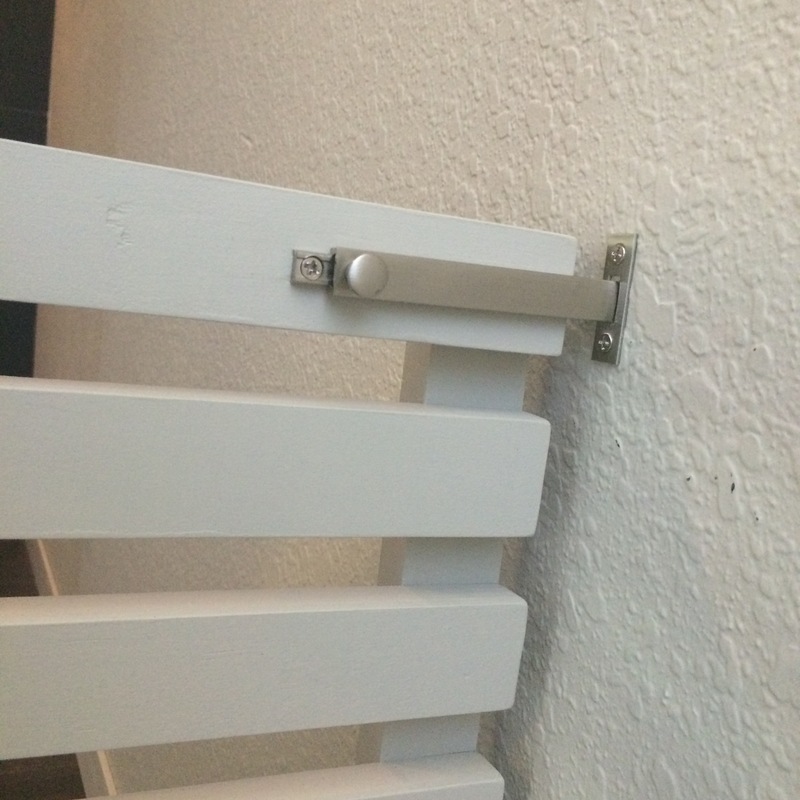 Most DIYers with the same issue chose to mount a 2×4 to the wall and then add an exterior gate latch you’d see on a fence; an ugly but convenient choice. We were not working with a doorway, but a hallway at the top of the stairs so making a custom gate was the best choice over all. For the top we chose to make a horizontal slat gate, but for the bottom of the stairs we bought this bad boy due to space issues. First we measured the space. That’s always a good way to start, right? We knew the slats would need to extend to the edge of the frame of the gate. This meant that building our frame would be our first step. How high do I want this gate to be in comparison to the kid’s current size and how big he will grow before the gate is no longer needed? How many slats do you want? 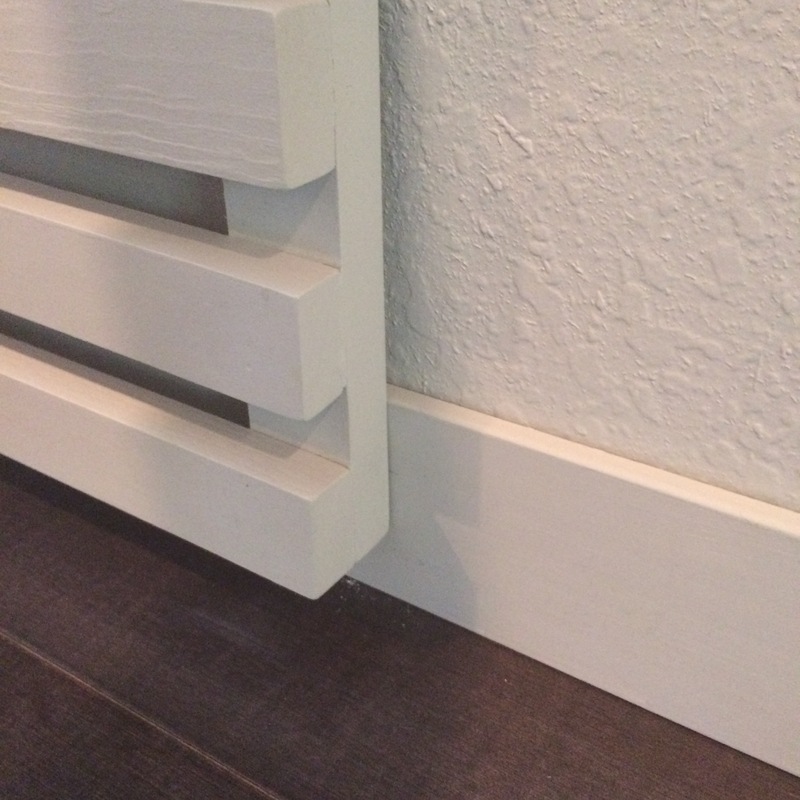 We wanted 1 inch between each slat and allowed that to dictate how the height. How high off the floor should the gate sit since it needs to swing open? Is it small enough to prohibit a head or foot from getting stuck? We determined 1 1/2 inch was the the best for us. Your measurements may vary. Start by determining the best vertical height of the frame for your gate. Cut those two pieces and lay them on a sturdy work surface. The horizontal top and bottom of the frame need to be the exact length of your gate. These horizontal pieces need to extend to the far edge of the vertical part of the frame. Determine the length horizontally as well. We made sure there was a 1/2″ gap on either side of the gate to allow for the hinges and for the swing. We didn’t want the gate to scrape against the wall when closing or opening. 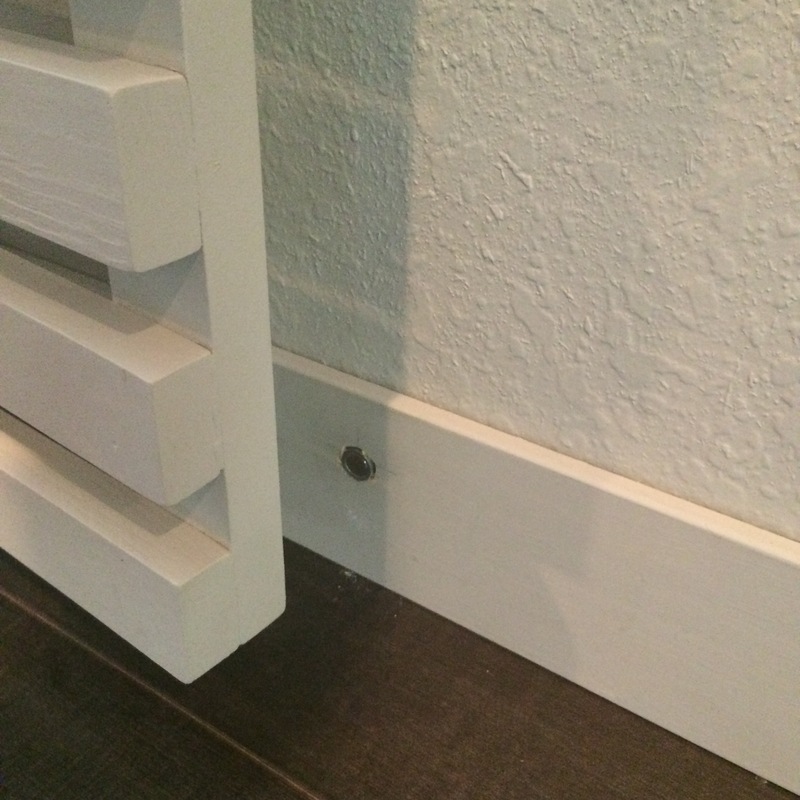 We also took into account our baseboards. Ours are thin, but your measurement may be different if you have thicker styles. 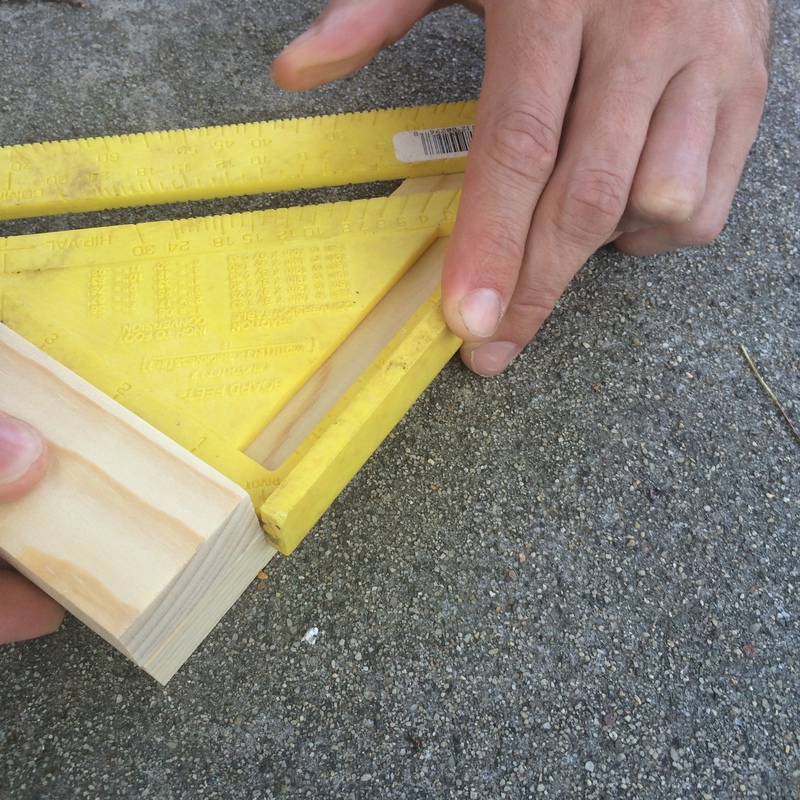 To assemble the frame, use a square (measuring tool) to ensure a perfect 90 degree angle and then clamp before nailing. 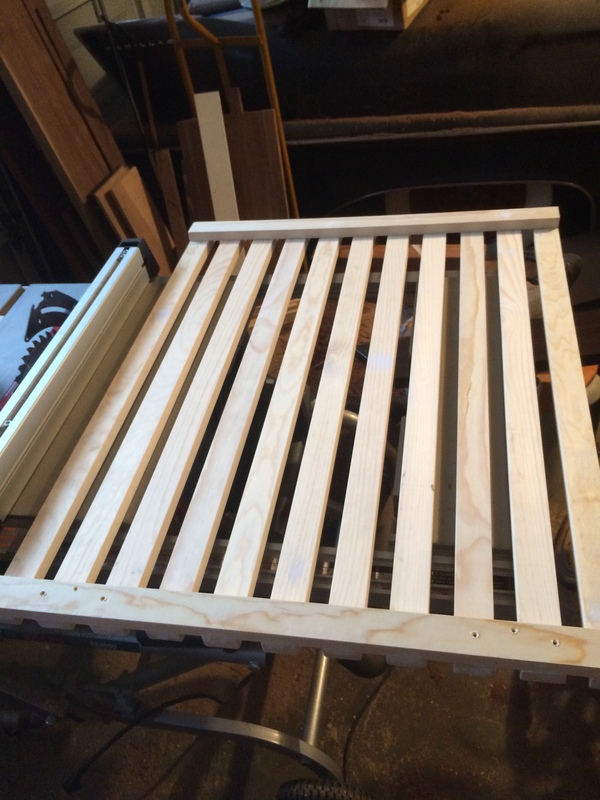 Each horizontal slat will be the same length as the top and bottom slat. Once you have made your frame, take it to the spot you want it installed and test it. Is it a good size? Yes? Then you are ready to install the rest of the slats. Again, the distance between your slats is determined by how tall your gate is and how much distance between each slat prohibits little hands from getting stuck and how many slats you want to put on there for your personal taste. We decided on 1 inch spacing between each slat. 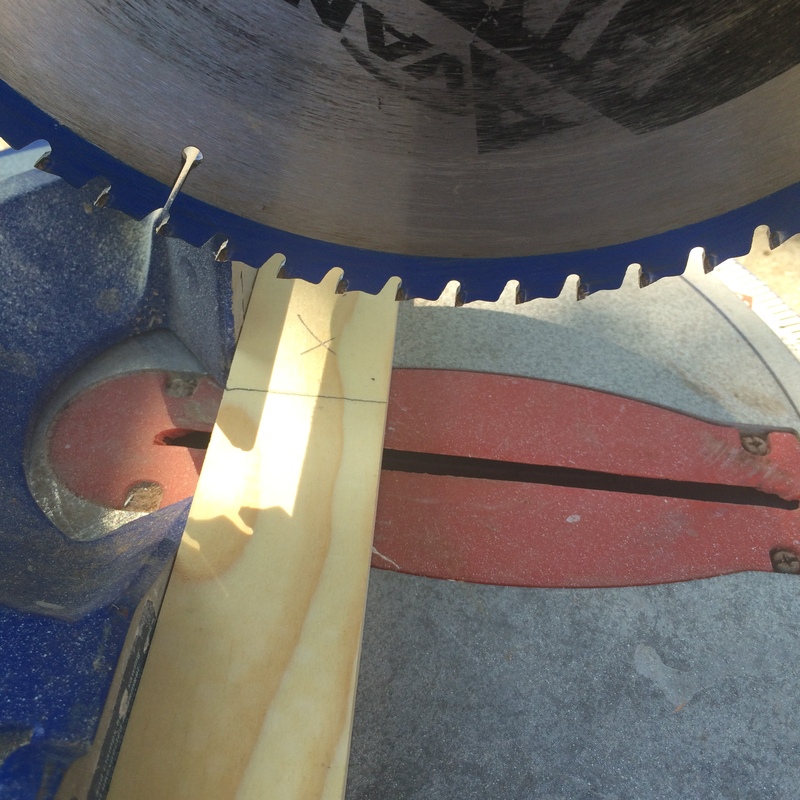 We then cut our slats. As stated, we made them long enough to meet the outside edges of the frame so we could make sure we nailed them securely into the frame. We used a square and clamps each time. We lightly sanded the wood to make it splinter free and to slightly round the corner, AKA kid friendly. Then we spackled the nail areas to cover and create a smooth surface before painting. 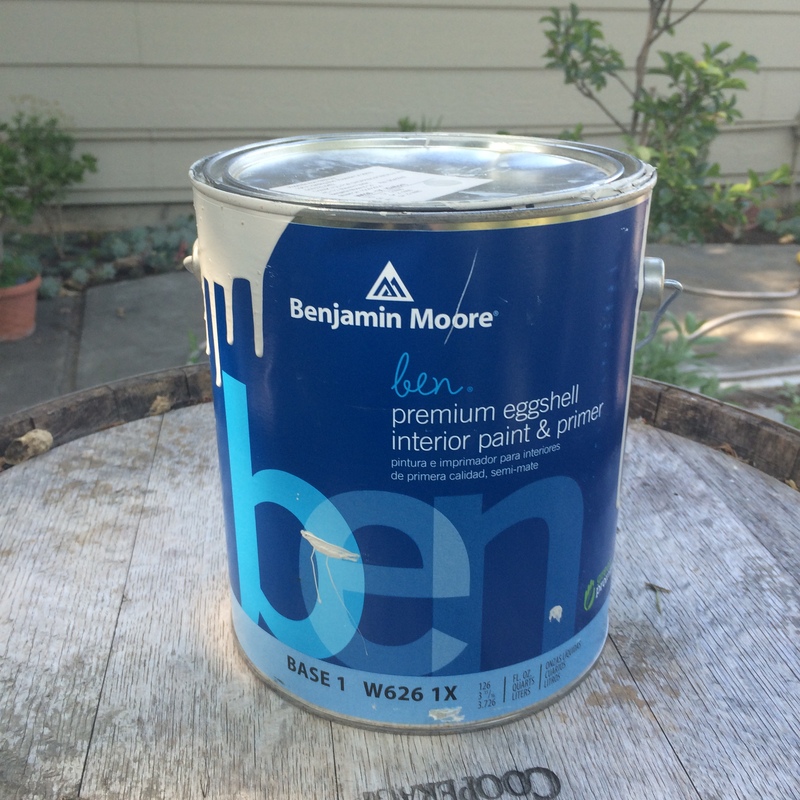 After that, we lightly sanded after spackling and again to remove any high spots after painting. We added the surface bolt on the outside so our child couldn’t open, shut easily or just Eff with it, in general. Originally we wanted to stain the gate to add a rustic feel and to offset the clean open space to match our black walnut wet bar counter top. However, pine is a soft wood and after seeing a sample stained, we decided we either needed to build the baby gate out of black walnut or paint it instead to match our walls. Our cheap asses chose the latter. Lastly, we added a magnet latch for when we want it open, but not dangling away from the wall. Written by Mariah Cook. She is happily married in Sacramento and has one little monster. Share Your Motherhood or Fatherhood Story With Us! Should I Take My Kiddos to the Crocker this Summer? Yes!